Louis Stewart, the recipient of an honorary doctorate from Trinity College Dublin, began his international career in 1968 when he was awarded the special jury prize at The Montreaux International Jazz Festival. Shortly thereafter he began working with Benny Goodman, an association that lasted three years, and gave way to an extended and prominent period with the late, great, English saxophonist/flautist Tubby Hayes. As a member of Ronnie Scott's quartet and quintet for several years, Louis began recording as leader in the mid-'70s, making albums with Sam Jones and Billy Higgins, with Peter Ind, and later, with Red Mitchell, saxophonist Spike Robinson, pianist Bill Charlap, and now, more recently again, a new CD, recorded in Venice with alto great Peter King ("Angel Eyes"). 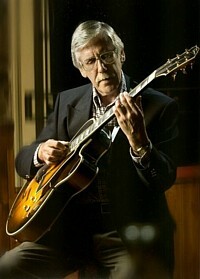 In the 70s Louis began his lengthy association with George Shearing (with whom he has toured America, Brazil and all of Europe; and recorded eight albums - several in trio with Danish bass master Niels-Henning Orsted-Pedersen, and in quintet with vibist Steve Nelson and drummer Dennis Mackrel). He began working with Canadian genius-orchestrator and arranger, Robert Farnon in 1976, and at least ten albums resulted: with singers Joe Williams and Eileen Farrell, with Shearing and with trombone legend J.J. Johnson, on all of which he is a prominently featured soloist. In 1994, as a member of the Shearing trio, Louis featured for a week opposite Tommy Flanagan's trio in The Blue Note, New York. This led to an association - still active - with Peter Washington and Lewis Nash which has included a week-long engagement, as leader, at the legendary Village Vanguard, NYC (with the masterful Richard Wyands in the piano chair, and, for that particular week, Kenny Washington, drums, substituting for Lewis Nash). Continuing to make Dublin his home, Louis performs regularly in Germany and Norway, where, in the national theatre, Oslo, his James Joyce/Ulysses inspired concert piece "Joyce Notes" has been produced to acclaim.